An aerial view of Copco 1 Dam on the Klamath River in California. It is one of four dams scheduled to be removed as part of the Klamath Hydroelectric Settlement Agreement. 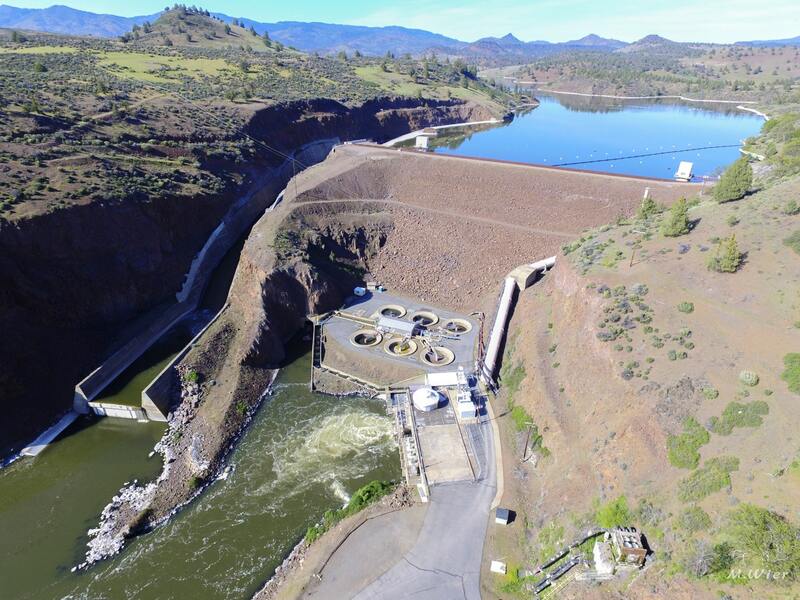 No one is popping the champagne corks just yet, but the process to remove four hydroelectric dams on the Klamath River just took a big step forward. 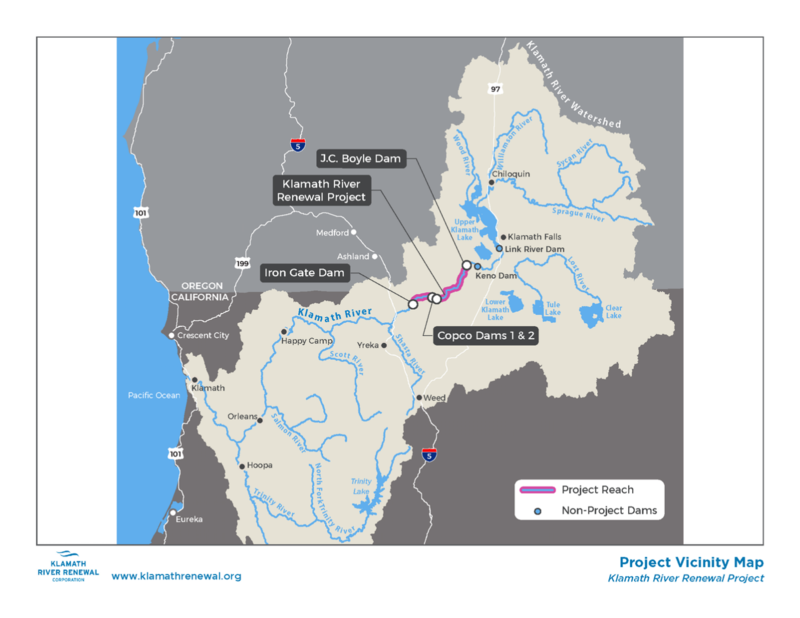 On June 28, the Klamath River Renewal Corporation released the Definite Plan for the Lower Klamath Project, a 2,300-page detailed analysis of how the reservoirs would be drawn down, the dams removed, the materials disposed of and the formerly inundated land restored. The document will be reviewed by the Federal Energy Regulatory Commission (FERC) and an independent board of consultants. After any necessary revisions are made – and if no further regulatory hurdles emerge – removal of the dams would begin in 2021. The dams – Iron Gate, Copco 1, Copco 2 and J.C. Boyle – are four of six dams along the mainstem of the Klamath River, which runs for more than 250 miles from Oregon’s Upper Klamath Lake to the Pacific Ocean in Requa, California, just south of Crescent City. The dams have been blamed for failing populations of wild fish runs, such as salmon and steelhead, as well as exacerbating water quality problems in the river. Their removal would open up 400 miles of mainstem and tributary habitat and would be an unprecedented endeavor. “There’s never been four dams removed simultaneously anywhere in the U.S. or beyond,” said Steve Rothert, California regional director at the nonprofit American Rivers. Rothert is eager to finally see the dams removed. And he’s not alone. The Karuk and other Klamath River tribes have long opposed the dams, which blocked fish migration to the Upper Basin. But the effort to remove them took on renewed fervor in the early 2000s when stakeholder meetings first began, triggered by the relicensing process for the dams, owned by PacifiCorp, as part of the 50-year review process by FERC. In 2004, the Karuk took their fight against the dams to Scotland to protest at shareholder meetings of Scottish Power, which owned PacifiCorp. A few years later, Scottish Power sold PacifiCorp to Berkshire Hathaway Energy, and the fight moved to Warren Buffett’s hometown of Omaha, Nebraska. “The work with the company started out being very confrontational,” said Tucker. But over time that changed, driven largely by economics and a growing coalition in the Klamath River Basin interested in dam removal and restoration. By 2010, estimates to address new requirements for fish passage and water quality, including reducing toxic algae blooms, put the cost of keeping the dams at more than $400 million – higher than the current costs for removing the dams and the subsequent restoration work. The dams are used only for hydropower and not water supply or flood control, and so the expense to upgrade them to obtain a new operational license from FERC didn’t seem to justify the amount of electricity they generated for PacifiCorp, according to Tucker. For a number of years, efforts to remove the dams were tied to a larger plan, the proposed Klamath Basin Restoration Act, which dealt with other issues of water management in the Upper Klamath Basin, but that fell through after Congress failed to authorize it in 2015. 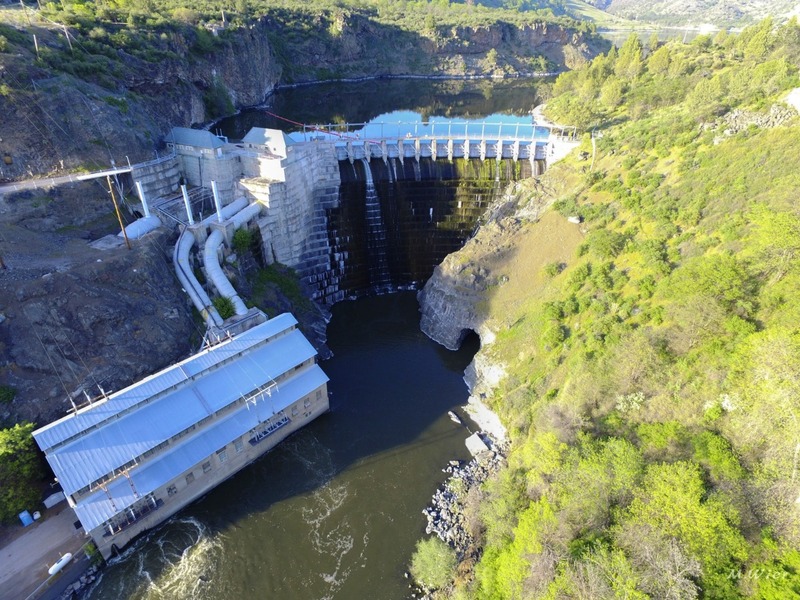 Dam removal efforts pushed forward, however, and in 2016 an amended Klamath Hydroelectric Settlement Agreement was finalized. PacifiCorp agreed to transfer the dam licenses to a newly created entity, the Klamath River Renewal Corporation, which would then take over the decommissioning and removal of the facilities, pending approval by FERC. The project will be paid for by two primary sources: $200 million that comes from PacifiCorp ratepayers and up to $250 million from Proposition 1, a water bond passed in California in 2014. The project estimate puts costs now at $398 million. But before the dams are breached, considerable work will take place to improve local roads to handle the construction traffic, and to prepare the sites that will be used for staging and disposing of materials – all of which is detailed in the Definite Plan. All four reservoirs will be drawn down simultaneously in a roughly eight-week period beginning in January, currently scheduled for 2021, explained Mark Bransom, executive director of the Klamath River Renewal Corporation. “We fully appreciate that it is going to be something of a significant impact,” he said. The time of year was chosen to minimize risks to fish, many of which are likely to be in tributaries or the ocean at that time. The best-case scenario would be a wet winter with a number of high-flow events that can help move the sediment that’s been trapped behind the dams, said Rothert. There will inevitably be some fish mortality in the process, but “I think everyone understands the trade-off there – it’s a short-term hit for a long-term benefit,” Knight said. In addition to ecological considerations and technical concerns, the Definite Plan also specifically addresses how to deal with the cultural resources of the tribes that are around the edges of the reservoirs or even inundated by the reservoirs themselves. There are also some private property issues related to flood risk in a section of the river 18 miles below Iron Gate Dam. “We’re undertaking efforts to protect structures that are likely to be at some increased risk” of a 100-year flood, said Bransom. The dams themselves will then be removed – with Iron Gate the tallest at 173ft high and Copco 2 the shortest at 33ft – but so too will all the other associated infrastructure, including canals, turbines, powerhouses, water intakes and a fish hatchery. Then the process of restoration of the formerly inundated lands will begin. “There are many, many square miles that will be exposed upon drawdown of the reservoirs, and so we have to have a detailed proposal on how we will reestablish native vegetation and stabilize the site and do work to provide habitat where appropriate to assure tributary connectivity,” said Bransom. The largest reservoir area is Copco 1 at 1,000 acres. With the four dams gone, fisheries groups believe that fish populations are likely to rebound quickly. “What American Rivers has seen hundreds of times across the country is that the fish that have been blocked for decades, and sometimes over a century, just instinctively know that they need to swim past where the dam used to be and keep going and will repopulate and recolonize historic spawning grounds often in the first years and even the first weeks of access,” said Rothert. Knight agrees that “tributary restoration is one of the big things that needs to be done to fully realize the potential” of the river. Addressing flow issues in the Upper Klamath Basin where water is diverted for farming and ranching is another long-term problem that needs to be solved. Tribes, environmental groups, agricultural groups and federal agencies have butted heads over disagreements there for years. On Friday, a federal judge in San Francisco will hear a case brought by the Klamath Tribes against federal agencies to protect water levels in Upper Klamath Lake for endangered fish. A ruling in the Klamath Tribes’ favor could cut off water for irrigators in the Upper Klamath Basin and reignite a regional water war. “Things could get really ugly this summer on the Klamath,” said Tucker. There is currently a “lot of tension around water rights” in the basin, said Rothert. This article originally appeared on Water Deeply. You can find the original here. For important news about water issues and the American West, you can sign up to the Water email list. 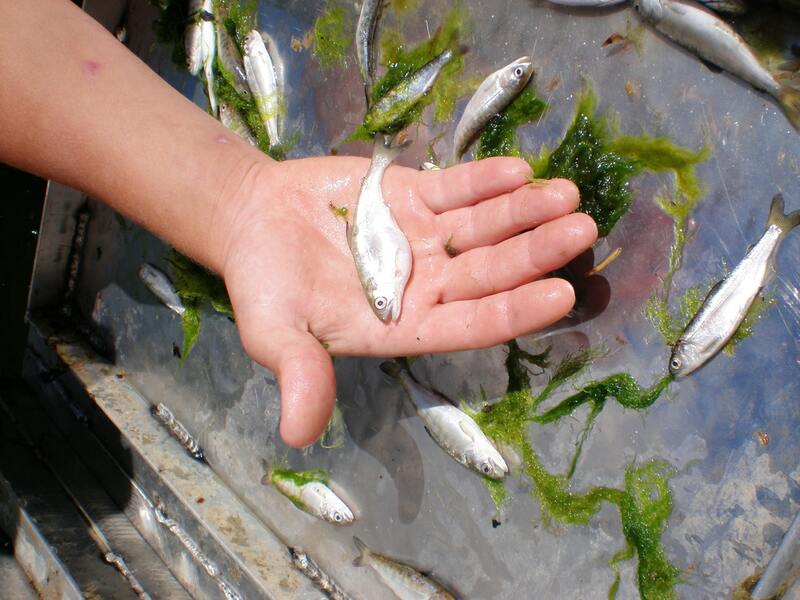 The planned removal of four dams on the Klamath River is intended to help improve fish runs and prevent disease outbreaks like the one that has stricken these juvenile salmon. 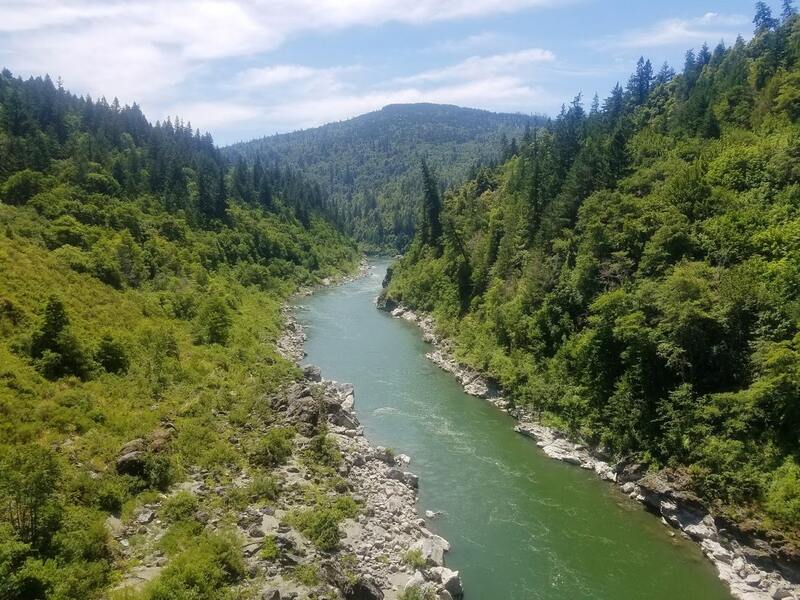 A stretch of the Klamath River, which flows 250 miles from Upper Klamath Lake in Oregon to the Pacific Ocean in Northern California. At 173ft, the earthen Iron Gate Dam is the tallest of four dams planned to be removed from the Klamath River in California and Oregon. A project map showing the dams along the Klamath River, including four that are scheduled to be removed.